Scottsdale, AZ board-certified plastic surgeon, Dr. Carlos Mata, provides his patients needing corrective and cosmetic surgery on the eyelids with blepharoplasty, or eyelid surgery. We can enhance the appearance of your eyes by eliminating excess skin and smoothing the eye area. Your exact procedure depends on your specific desires combined with your eyelids’ general physical condition, the effect of sun damage, your skin’s thickness and elasticity, existing wrinkling, the amount and distribution of eyelid fat, your underlying bone structure, allergies, heredity, and other factors to be discussed with Dr. Mata. The most important factors determining the final appearance of your eyes are Dr. Mata’s sense of aesthetic flair, understanding of eyelid anatomy, and his technical skills. Dr. Mata, a.k.a. Dr. Scottsdale, will determine the best combination of procedures to achieve your desired result. 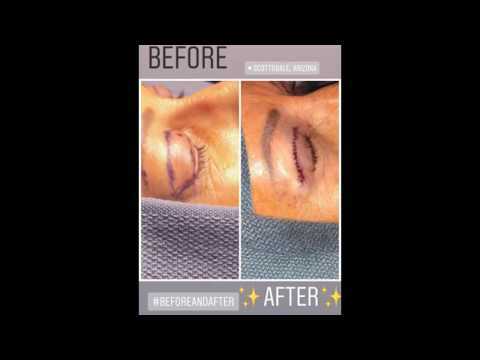 "Eyelid Surgery Done Right! - My experience was great , it was my third eyelid surgery to correct previous surgery. Before seeing Dr.Mata I had met with other doctors, but did not feel comfortable. I continued research and found Dr. Mata through Realself. I am very happy with my results and I can tell that Dr.Mata really cares about his patients. He is a perfectionist and does not disappoint!" The most common problem with the upper eyelid is excess skin that droops and hangs over the eyes. Not only does this look unappealing, but it may also obstruct vision for a patient. The doctor will create an incision along the natural fold of the eyelid and extract any excess fat and tissue to remove any bulges. Once done, excess skin will also be trimmed and the cut will be closed with fine sutures. There are cases when fat tissues are only repositioned instead of excised. Eyelid surgery is performed with general anesthesia. If the procedure involves both upper and lower eyelids, the plastic surgeon will typically manage the upper eyelid first. On average, it takes 1 – 2 hours to complete the operation. The patient will be sent home for recovery. For the first few days, there will be swelling and discoloration around the area. It is advised that the head is elevated for the first few days. Pain medications and antibiotics will be prescribed to manage the initial discomfort. Strenuous activities must also be restricted. Crow’s feet and forehead wrinkles are better treated with procedures such as a facelift, browlift or a cheek lift as the results of the eyelid surgery are confined to the eyelids only. Eyelid surgery may also be combined with a nonsurgical procedure such as BOTOX, which combats wrinkles on the forehead and around the eyes. An injectable filler may also be effective because it adds volume to hollow areas for a softer, smoother appearance. Complications and irritations after surgery are rare. Patients must strictly adhere to care instructions prescribed by the surgeon to minimize any risks of infection as the eyes may be sensitive after surgery. Patients must always take precaution of protecting the eyes from the sun and wind during the first few weeks of recovery.